Update: Kathy is unable to make it to Content Marketing World and Jenifer Walsh, director of customer engagement marketing for Current, powered by GE will be taking the stage in her place. Content Marketing within large, complex organizations is not for the faint of heart. Many big companies are legacy brands with years of history behind marketing status quo. Today’s business environment calls for constant innovation and for marketers that can champion the necessary change, there can be significant impact. In that context, I introduce you to Kathy Sterio from General Electric. Her time with GE has spanned several decades and undoubtedly, she has observed and championed her share share of marketing innovation. With our agency’s client mix, this is something we are often involved with navigating and that’s why I’m really looking forward to Kathy’s keynote panel at Content Marketing World: “Content Marketing and Change Management – Making It Real“. Despite being on vacation, Kathy was kind enough to make time to answer questions about her role as a marketing innovator at GE, overcoming strategic obstacles, facilitating organizational change, predictions and the role of gamification in marketing. Yes, I asked about Pokemon Go! Your career at GE has spanned 23 years in a mix of roles. What are some of the lessons that have best prepared you for your current role as General Manager for Product Management & Marketing for GE Lighting? What do you like best about your role? I learned the most by taking a variety of roles in order to deeply learn about our customers and our business. I have had roles in operations as well as commercial functions and appreciate that I was able to gain new skills or deepen my understanding of our customers’ problems to solve in each one. I’ve learned that in a dynamic industry that you need to understand the market environment in order to lead through change. I’ve learned that in a dynamic industry that you need to understand the market environment in order to lead through change. I am thrilled about my new role leading Product Management & Marketing for GE Lighting as the industry is in the midst of a technology change to LED lighting as well as a move to “smart” products that will ultimately change buying behavior for our product. Navigating that change successfully for our customers and our business is an exciting challenge. Congrats! You have been instrumental in repositioning GE Lighting as a software infrastructure business which is impressive given the 140 year-old, traditional light bulb history of the company. What role did content marketing play in that transformation? Content marketing played a large role in helping us to tell the story of the transformation of our business. Lighting is often taken for granted and we needed to have our customers understand the value of their lighting fixtures as an existing infrastructure poised to be the data collection point to help them learn more about their operations. Lighting is in the perfect position for sensors, is everywhere, and is powered – a great story to tell, but one that changes the value proposition of LED lighting from just energy savings to productivity outcomes for our customers. Content marketing helped us to get that message across to our customers. What do you think are some of the fundamental obstacles companies face when trying to execute a global content strategy? What are some possible solutions to those challenges? Global content strategy can be tricky as many of the topics need to be executed locally. The content needs to be relevant to the specific market and meaningful to those customers. However, the tools and processes we use are the same around the globe. The way we work through this is to have a consistent set of messages that are relevant for our business and then tailor the story as needed to meet the local requirements. A recent study by Forrester Research cites culture as the biggest barrier to CMOs’ success which dovetails nicely with the topic of your keynote panel at Content Marketing World, “Content Marketing and Change Management – Making it Real”. What broad advice can you share when it comes to inspiring organizational change needed for a strategic approach to content marketing strategy? This is a big topic and I am looking forward to the discussion at Content Marketing World. For me it boils down to talent, proof points and making it easy for everyone to participate. Having the right talent on the team helps to inspire change quickly. Having the right talent on the team helps to inspire change quickly. We have opted to hire from outside of the company to ensure that we get experts to helps us on this journey rather than to develop talent from within the company. This has accelerated our learning and success. Additionally, in order to get other functional teams bought in to our strategy, we are tracking the impact of our work and publishing success stories of how marketing influenced an order. Finally, we are utilizing LinkedIn Elevate to make sharing our stories easy for employees and to engage their networks in our storytelling. What are you looking forward to most at this year’s Content Marketing World conference? I’m excited to learn about what’s next. This space is evolving so quickly that there is plenty to learn daily and I know that I will gain insights from the event that I can apply right away. What advice would you have for a brand that is on the cusp of committing to a more content and customer centric approach to communications and marketing? Any suggestions on what role their first hire should be? For a content strategy to be successful, it has to be relevant and meaningful to your audience. I would advise everyone to start with the customer. Identifying the problem the customer is trying to solve is job one. For a content strategy to be successful, it has to be relevant and meaningful to your audience. Additionally, I would advise to hire the right talent that will help you come up to speed as quickly as possible and to invest into tools / infrastructure to execute. There’s no shortage of content marketing advice in the industry right now from the importance of mobile experiences and predictive analytics to working with influencers on co-creation and truly measuring content marketing ROI. What sources (types) of information do you rely on to help with prioritization of approach and tactics within your marketing organization? The key for us is to look at typical “vanity” metrics (views, downloads, forms filled…) PLUS tie them to revenue. We measure marketing effectiveness in terms of ‘marketing influenced’ revenue and deals in the pipeline. Content Marketing is one part of the story of the sale and we have worked to tie that to our lead management process. We leverage tools like Google Analytics to help us understand which topics and keywords are resonating and to try to identify why certain pieces are more effective than others. Any predictions about what the state of content marketing will be in 5 years? Does text still have a future? Wow – 5 years is a long time in an area like this that is transforming rapidly. I think that the future is a blank slate and that storytelling will still be critically important as the amount of available content will be dramatically increased. It will be interesting to see how companies navigate the ability to deliver messages directly to their customers and balance their sales channels. Eventually, I see everything being personalized and customized. Eventually, I see everything being personalized and customized due to increased machine learning capabilities. I believe that text will still be relevant – there will be a customer who prefers text over video / graphics and those preferences will be enhanced, not lost. What do you think about Pokemon Go? Do you see any applications for GE when it comes gamification and virtual reality for consumer marketing? I’m completely intrigued by Pokemon Go – my son and his friends have logged a lot of miles on their bikes this summer to play at various locations around town. I think gamification has an application in our space to help customer find the proper product at the shelf. Also, virtual reality could be helpful for customers to see the impact of lighting on their environment – something a package alone cannot convey. Now let’s play a little social network word association. After each platform, share the first word or short reaction that comes to mind. Kathy Sterio is General Manager for Product Management & Marketing for GE Lighting where she is responsible for setting and executing a growth strategy in a transforming industry within the retail channel of distribution. 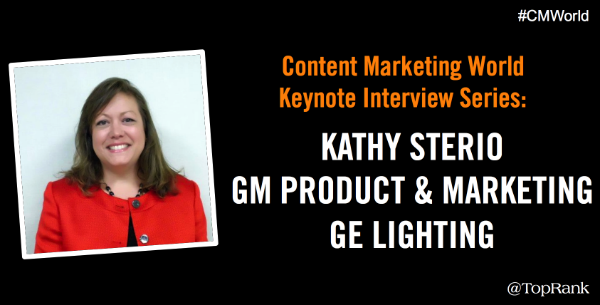 Prior to this role, Kathy was the Chief Marketing Officer for GE Lighting & Marketing Leader for current, powered by GE where she led global B2B global marketing efforts. Kathy’s experience includes roles in: Sourcing, Supply Chain, Pricing, Customer Service, Sales and Marketing. Kathy is also an active member GE’s Women’s Network serving as a sponsor, mentor and advocate. She is a recipient of the Diversity MBA Award and serves on the Board of Directors for the Lake County YMCA. Whether your business is Fortune 500 or Inc 5000, be sure you check out Content Marketing World in Cleveland, which is happening September 6-9. Over 4,000 attendees from 60 plus countries will be there right along with you – a great networking and learning opportunity! Content Marketing World provides a cornucopia of opportunities to find answers to all the questions you might have about content marketing and is probably the highest concentration of content marketing experts, vendors and practitioners than you’ll find anywhere else in the world. It’s a must-attend event!